The University is proud to offer a Master of Science degree program in Speech-Language Pathology (SLP). A master's degree is the standard credential in the profession of SLP. 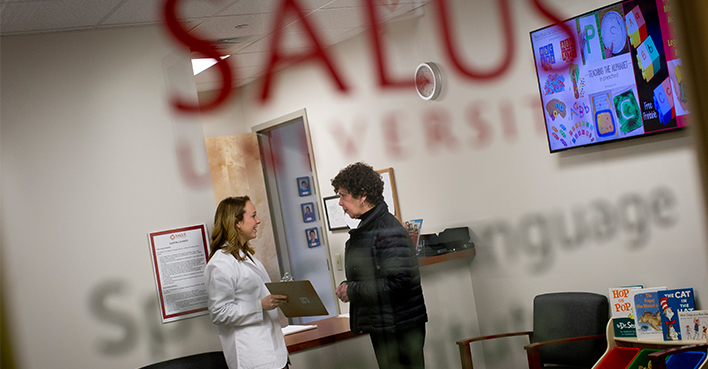 In keeping with the Salus emphasis on a sound background in the biomedical sciences, interprofessional education and clinical skills, graduates of this new degree program will receive the necessary education and training to become integral members of today’s healthcare and education teams, and future leaders in their profession. The Salus University reputation for quality and innovative education is well-earned. The opportunity to interact with students and faculty from Salus programs in optometry, audiology, physician assistant, public health, occupational therapy, and blindness and low vision education and rehabilitation will afford SLP students a unique and valuable perspective not found in all SLP programs. For those SLP students who are interested in research, Salus University also has a degree program in the biomedical sciences. To educate and train graduate-level students to become exemplary professionals in speech-language pathology who provide excellence in service delivery to individuals with communication and swallowing disorders, and who engage in and promote interprofessional education and practice, lifelong learning and prevention of communication and swallowing disorders. SLI serves as a clinical training site for SLP students at Salus.